Kastar Diesel Compression Test Set for Light Cars and Trucks is a must have for diesel light cars and trucks in the global market. The Kastar Diesel Compression Tester has a handy deflator for releasing air and re-testing, and A 16-1/2'' wire reinforced hydraulic hose that has a Quick Coupler on a swivel for ease of connection. The Kastar set includes adapters for Audi, BMW, Isuzu, Mazda, Mercedes, Mitsubishi, Nissan, Peugeot, Toyota, VW, Volvo, GMC truck, Hino, Isuzu truck. Kastar Diesel Adapter for Round Cylinder Leakage Tester. for use with CLT-2, CLT-1 and diesel adapters. Measure diesel engine cylinder ability to hold compressed shop air. QC X QC plug. Kastar Diesel Compression Tester Tests cylinder pressure on diesel cars and trucks. Handy deflator for releasing air and automatic re-setting of gauge for repeat testing. Kastar Diesel Compression Test Set. This is a must have for diesel work in the American market. Includes adapters for GM, Isuzu, Lincoln Mark VII, Continental, Ford / Navistar, Audi, Mercedes, Peugeot, Toyota, VW, and Volvo. Kastar Diesel Compression Test Set - Light Cars/Trucks. A must have for diesel in the global market. Adapters for Audi, BMW, Isuzu, Mazda, Mercedes, Mitsubishi, Nissan, Peugeot, Toyota, VW, Volvo, GMC, Hino, Isuzu. 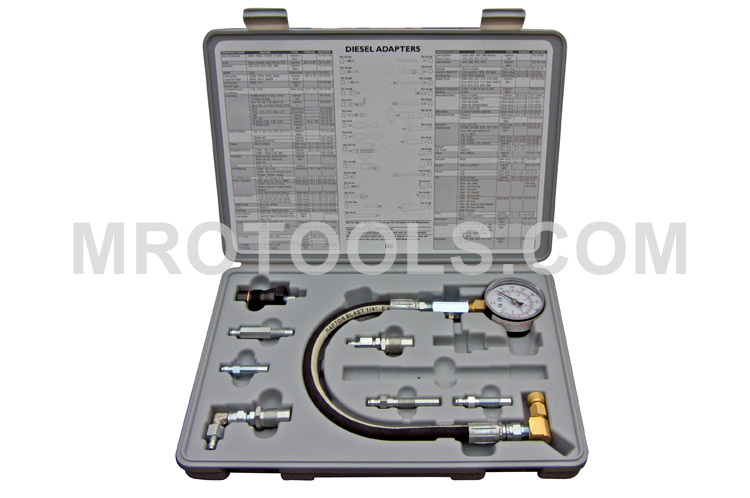 Kastar Diesel Compression Test Set With Tester and Adapters. Contains tester and all the most popular adapters needed to test heavy-duty trucks and equipment. Kastar Diesel Compression Adapter Set. Contains all the most popular adapters needed to test heavy-duty trucks and equipment. 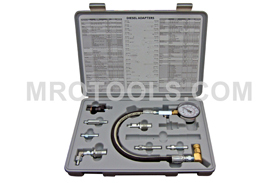 The TU-15-52B Kastar Diesel Compression Test Set - Light Cars/Trucks is one of thousands of quality tooling products available from MRO Tools. Please browse Kastar Diesel Compression Testing Equipment for tools similar to the TU-15-52B Kastar Diesel Compression Test Set - Light Cars/Trucks. TU-15-52B Kastar Diesel Compression Test Set - Light Cars/Trucks description summary: Kastar Diesel Compression Test Set - Light Cars/Trucks. A must have for diesel in the global market. Adapters for Audi, BMW, Isuzu, Mazda, Mercedes, Mitsubishi, Nissan, Peugeot, Toyota, VW, Volvo, GMC, Hino, Isuzu. Quantity discounts may be available for the TU-15-52B Kastar Diesel Compression Test Set - Light Cars/Trucks. Please contact MRO Tools for details.